In December, there are a lot of Omega replica watches published in our market, they include Seamaster Commander 007 from UR factory, Seamaster 300m Blue from VS, Planet Ocean Ceramic from VS. These watches are all the latest models in 2018. VS factory mainly produced Panerai replicas in the past, but now they also make some good quality replica Omega watches, maybe they have tasted the sweetness from making the Omega Spectre 007 replica, you know, this watch created a high sales record in 2016. 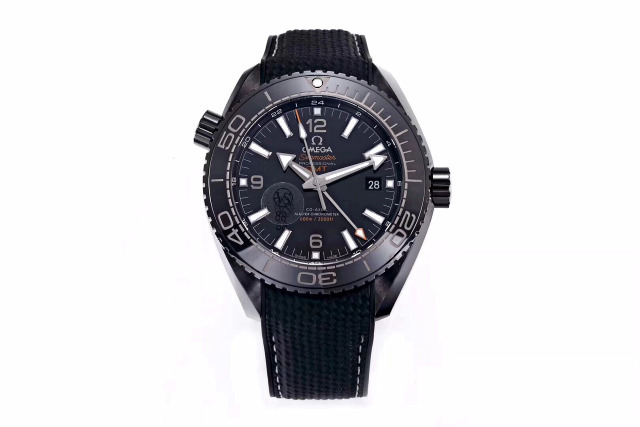 Now, a lot of Omega watches made by VS factory have ranked a high position in sales of replica watches, including this Planet Ocean Deep Black ceramic watch. 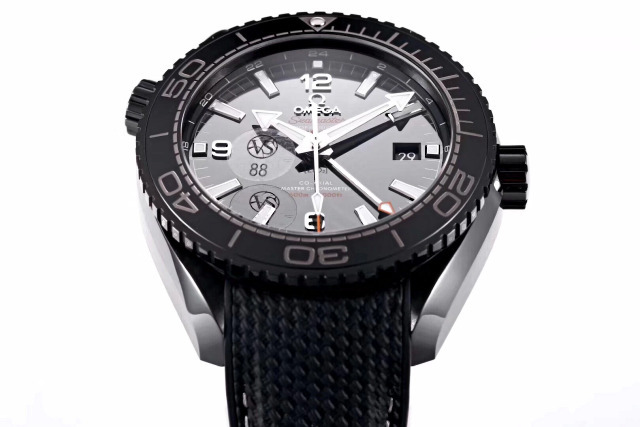 This Deep Black Planet Ocean is a full ceramic watch, I never saw Omega used ceramic case on their Planet Ocean series, maybe this is the first time. 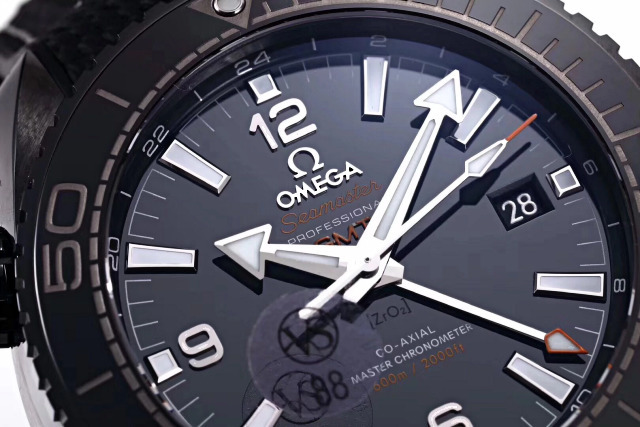 this full ceramic Planet Ocean replica watch is greatly different from other Omega watches. 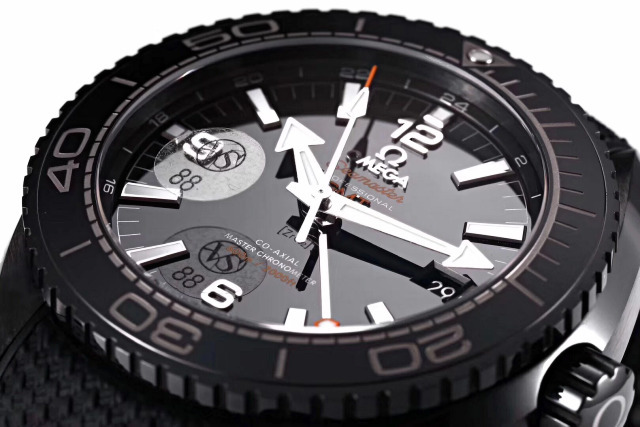 The case is fully made of black ceramic, it is a pioneering work Omega made in their Planet Ocean. The case is brushed, while the edge of lugs is polished, seeing the side, the case has a graceful arc shape. 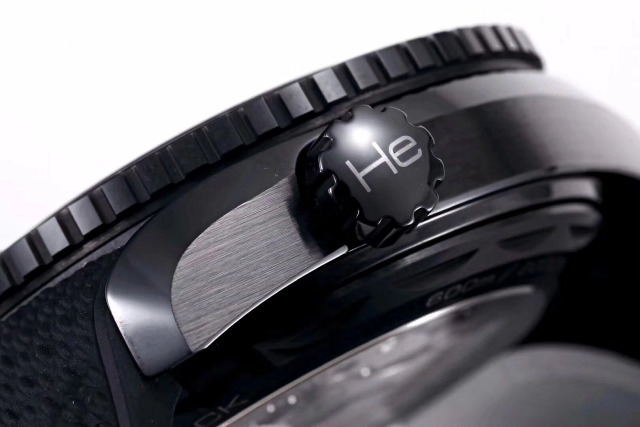 The bezel uses high grade black ceramic with silver engravings. 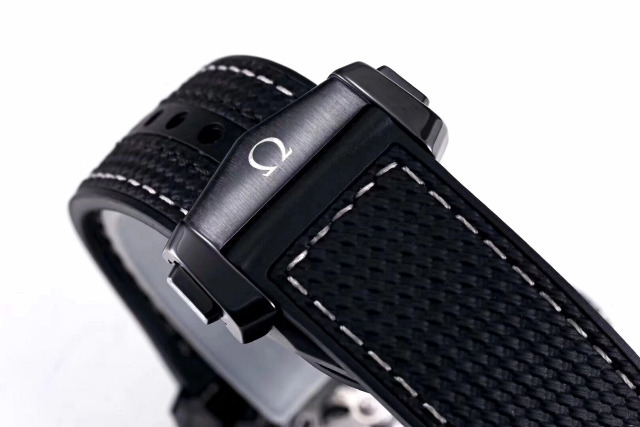 The case back is see-through sapphire crystal, VS factory developed Omega-patented Naiad Lock system, you only need to rotate the case back a bit to lock it perfectly. Check the case back, there are unique engravings on three lugs. The dial is black, which is made of real ceramic Zr02, this is the high gloss black dial that is exact 1:1 imitation of original. The dial has a correct hand stack, hour markers and hands have silver edge and are applied with white lume material, the dial has two different lume colors, hour markers and hour hand will emit strong blue light, minute hand will emit strong green light in the dark. On the outer dial, there are 24-hour gmt markers, GMT hand in the center has an orange triangle mark that is also filled with luminescence. 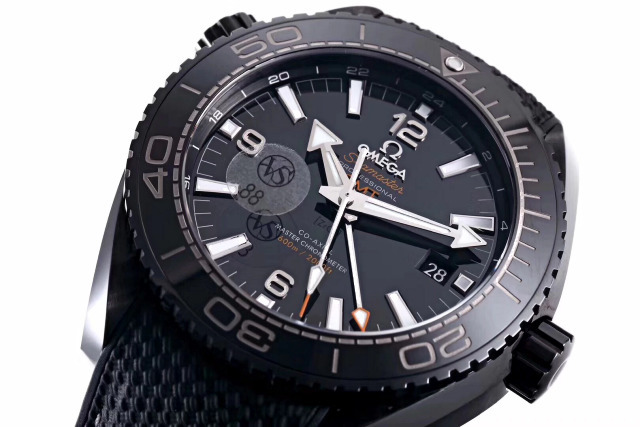 This Deep Black Planet Ocean is a GMT watch, if Omega makes a full ceramic Planet Ocean without GMT function, that will be very popular. 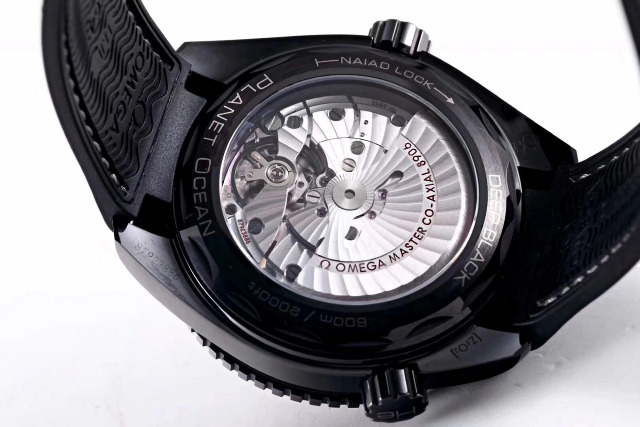 The movement is an Asia Clone 8906, which is based on a Chinese automatic movement. The movement looks very close to genuine Omega Cal. 8906, see the decoration on rotor and plate, as well as the 1:1 black balance wheel, they are really very similar to the decoration of Omega 8906. Here comes the watch specification of the replica. This entry was posted by Kenny in Cal. 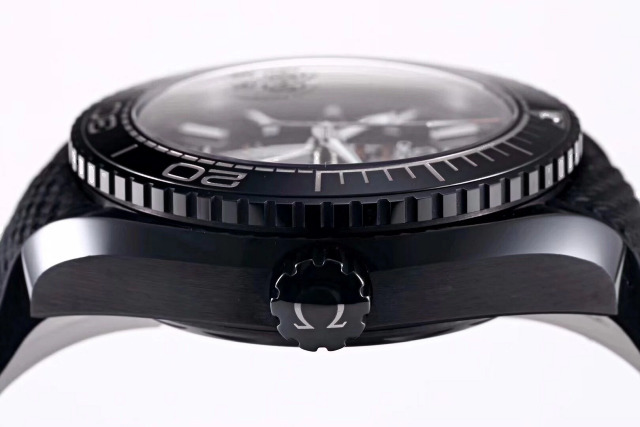 8906, Ceramic, Deep Black, GMT, Omega, Panerai, Planet Ocean, Rubber, VS Factory and tagged 8906, Black, Ceramic, Clone, Deep, Factory, Hostz, Movement, Ocean, Omega, Planet, Replica, Reviews, Watch, Watches.